What if you were the strongest superhero in the world? One-Punch Man comically shows just how boring such a life would be. One-Punch Man is the story of Saitama—a normal guy who one day decides to be a superhero. However, after training, he finds himself with two problems: hair loss and the fact that he has become so powerful he can defeat any enemy in just one punch. This comedic setup is the core of One-Punch Man. Saitama is a man who feels he has found his calling in life—only to discover the challenge he sought is non-existent. He dreams of epic battles and finds that no matter the hype, his enemies fall before him as if they were nothing. A lot of the humor in the anime in centered around his frustration with his situation. He wants to be number one by a nose, not by a mile. But while a clever setup, one ripe to be mined for comedy, it is also the series’ greatest weakness. Thanks to its premise, there is no dramatic tension to be found in One-Punch Man. By definition Saitama is able to beat anyone with just one punch—so of course he never has any chance of losing. The bad guys posture before every fight, explaining how they are the unstoppable (something I—like Saitama himself—found boring). There is no danger and thus no tension to be found when it comes to Saitama’s battles. Genos—Saitama’s self-appointed disciple (and parody/homage of every robot hero from The Mighty Atom to Mega Man)—is little better in the tension department. He too is among the strongest heroes in the world. And while he is defeated several times over the series, his robotic nature makes him next to immortal—able to come back from nearly utter destruction after a few repairs. Moreover, his cliché tragic backstory is treated as a joke, robbing him of any potential drama in that area. With no life-or-death stakes surrounding our two heroes, it’s more than a little hard to root for them—to be invested in their struggles. Beyond that, both are selfish to the extreme. Genos is so focused on his need to get stronger and defeat his arch rival that he cares about little else. Saitama could possibly be a sociopath as he cares for nothing or no one beyond how it affects him—passing up heroic opportunities that he deems beneath him and destroying whole cities out of apathy. Saitama is not alone is this, however. Most of the top heroes are likewise sociopaths at worst or assholes at best. Though, perhaps that is the point: “absolute power corrupts absolutely” as they say. The closest we get to a true hero in One-Punch Man is Mumen Rider—a completely normal guy that rides a bike but has the soul of a hero. 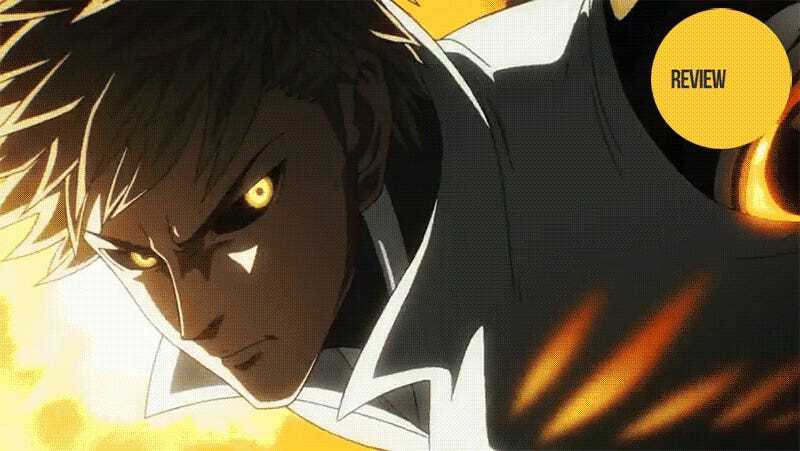 Perhaps the only scene with any real tension comes when he faces down a monster who utterly destroyed Genos—knowing full well he is about to be killed but is unwilling to simply give up and let massive numbers of civilians die. He is a far more sympathetic character than anyone else in the supporting cast. Sadly, he is just that: a member of the supporting cast with little comparative screen time. So with little to no drama, it’s up to the comedy and action to carry the story. Let’s start with the comedy. There are basically three forms of jokes in One-Punch Man: 1) Saitama being ridiculously overpowered, 2) heroes or villains giving long, rambling speeches about their origin stories and/or how strong they are, and 3) humorous situations stemming from Saitama’s limited intelligence and/or selfish tendencies. The first few times these jokes come up, they are quite funny, but (like most humor) become less so with each repetition. Though, I suppose it’s always funny to see someone punched in the balls, so there’s that. The action, however, is superb. Not only is it creative in its framing but it simply looks great on an artistic level—especially when it comes to Genos and his robotics. Even if the fight scenes are often pointless because of the premise, they are still a wonder to behold and are easily the best part of the series. On a side note, what I found most interesting when watching One-Punch Man is what it taught me about my own suspension of disbelief. Telepaths, monsters, robots, aliens, and a man who can kill anything in a single punch—these things I am okay with in a superhero story. A meteor leveling an entire metropolis with only a few minutes’ evacuation warning and not a single person dead? That I am unable to buy. 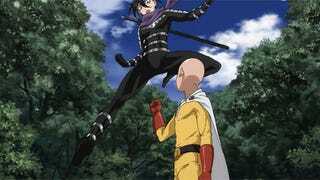 One-Punch Man is an anime that is appealing depending on how much you personally enjoy the humor and action. The characters and plot are basically one-note comic book parodies mixed with your standard anime tropes. Still, it has an excellent setup that results in a creative world where the superhuman has become the ordinary. When it comes down to it, there are far worse things to do with your time than watch Saitama and Genos play in such a world. One-Punch Man aired on TV Tokyo in Japan. It is available for free and with English subtitles in the US on Daisuki, Hulu, and Neon Alley (and on AnimeLab in AU/NZ).